20 free copies of Self Leadership and The One Minute Manager. *Eligibility limited to the Continental U.S.
What if you took three simple steps at the beginning of each work day that could dramatically decrease your stress and increase your energy by the end of your day? Try these three proactive behaviors that researchers have proven can do just that. Proactively ask for the feedback. People don’t resist feedback, they resist receiving feedback not requested. After heading a meeting, for example, ask your boss for feedback. Explain what you intended to accomplish and ask what she thought worked and didn’t work. Ask what she might suggest you do better next time. Asking for feedback prepares your brain to be more open, hear the feedback, and act on it. Feedback requested is far more effective than feedback imposed. When facing a problem, try a new proactive process to solve it. Rather than posing a solution that will probably get shot down, try this proven technique. Generate at least three alternatives with pros and cons for each, then choose one to recommend as a path forward. Communicate all your alternatives along with your recommendation to stakeholders. Research shows you’ll either get agreement on your solution or experience a learning moment. Either way, problem solved and stress reduced. Being a proactive self leader early in your day measurably decreases your experience of stress and increases energy by the end of your day. To effectively lead others, begin with your own self leadership skills—then, imagine the energy you’d unleash by developing your staff into self leaders, too. What does the practice of self-leadership look like to you? Susan Fowler is the co-author of the newly revised Self Leadership and The One Minute Manager with Ken Blanchard and Laurence Hawkins, and lead developer of The Ken Blanchard Companies’ Self Leadership product line. She is also the author of the bestseller Why Motivating People Doesn’t Work… and What Does. Fowler is a senior consulting partner at The Ken Blanchard Cos. and a professor in the Master of Science in Executive Leadership Program at the University of San Diego. Interested in this book! Great message about positive energy. Modeling a proactive approach to your day encourages your team to do the same. Great tips! It is amazing to me that my general manager if happy sets the tone for each day but if stresses he entire workforcef has a hard day. Positive energy really does work. Found many parts of the One Minute Manager to be so effective! I’ve found that offering options with a recommendation has been well received, especially when providing pros and cons of the items referenced and including how you chose the recommendation. As a leader, it’s a great developmental tool to require this of your team members, as well. “People don’t resist feedback, they resist receiving feedback not requested.” I definitely agree with this proactive behavior and have made it a practice by taking it to the next level! I invited one of my peers, the District Humanities Supervisor, to work with me as a coach. She gladly agreed and I consistently ask her for feedback as I prepare for meetings that I have to present and after presenting meetings that she has been able to observe. In addition, I have learned to always embrace feedback as the most important way to begin a reflection process by asking myself, “How effective was my action(s) versus how effective was my action(s) as perceived by others? I think that these tips are great! Short and to the point! I am going to print this and use this advice day to day. Thank you for sharing! Timely message! I’m working to drive the concepts of self-development and self-leadership throughout our organization. This fits nicely! Self-leadership starts with vision and discipline. Effectively articulating your vision for the organization reduces stress because everyone understands why you are making decisions you are making. Further, having the discipline to stay true to the vision will keep you pointed in a consistent direction. Equally important is remembering to recognize people that help along the way. Making someone else’s day is a great way to manage your own stress.Starting the day by sending a quick thank you or complimenting someone else’s work will make your day too. Being a proactive self-leader rather than reactive self-leader can help reduce stress and anxiety. Anticipating the needs of your team and environment will help propel your work and your purpose. The acknowledgement of the energy zapping aka sapping constructs can free us from shutting down or closing up when we meet the challenges of our journey towards becoming a better leader. Too often we may give in to old patterns when we can’t rally to see things differently because of this lack of energy and we may need the support of others around us to rally. I assert that anyone who does not discover how to lead themselves 1st, will at some point fail spectacularly as a leader or manager. The title sounds really good. I would love to get a copy it for my team mates, colleagues and of course for myself. I’ve been writing a series of blogs at work about feedback, and leading at your level – self leadership? I’ve have been looking for a good phrase to articulate just this point – unrequested feedback. We find that feedback is always traumatic for people, and unrequested or unexpected feedback seems to be resisted. Thank you for a great discussin starter. Must read more! Self Leadership is leadership from within; giving me the capabilities to move out and lead others. It requires self-awareness, confidence and belief in oneself. I know my intentions and they are defined by my values. Being aware of my strengths and abilities allows for development of my skills. I can then expand into new skills and abilities. My believe is I’m prepared to handle whatever comes my way. If I’m in a situation that I’m unsure of or made mistakes I can ask for guidance, accept feedback whether positive or negative and adjust accordingly to move on with the task at hand. I tried to act in a intentional manner, this allows me to control my situation by bringing forth my values and choices to lead me. I don’t want to re-act negatively or “in my emotions” but seek a positive outcome for the situation. My self leadership skills creates an environment where I can accept advice, leadership from others and have the ability to lead by example. It opens the door to creativity and trust. Gives me the ability to acknowledge and recognize the passion, gifting, strengths, weaknesses, potential and needs of others. Self Leadership give me the ability to grow and motivate other people to develop their potential therefore meeting and or exceeding the organization’s objectives, values and mission. Offering several solutions, with pros and cons, demonstrates you have thought through the issue, and the suggestions are given consideration. I have found that most of my suggestions have been accepted, or have led to an interesting discussion. Almost always is the resolution selected the best alternative. This is proactive thinking and reasoning. Feedback not requested is criticism. I really like the “self coaching” approach of generating 3 options AND I have found that managing my energy as a leader is more critical than managing my time! Susan Fowler is awesome! Always has insightful tips. I truly believe looking at yourself first is the key to being able to lead others. After 20 years as a leader, I still have so much to learn. Although I do not like to admit it, I am still embarrassed by positive feedback and am fearful of negative feedback. Intellectually, I want both. I am going to try asking for feedback in advance, this may prepare my brain for receiving the feedback since it will be expected. Thank you for the tip. I totally agree that “people resist feedback not requested” but many also resist requesting it in the first place. We all can benefit from feedback when it’s given in the spirit of improving performance for all. What a great concept! This would be awesome to read!!!! The problem I run into is with managers who aren’t very good at providing feedback. When so few people ask for feedback, managers never really get comfortable having those kinds of discussions. I guess it’s a chicken-and-egg thing. It’s funny how we react differently to feedback requested rather than when un-requested feedback is given…but it’s true! I appreciate the tips you shared. While sitting in my car outside my office, I often take a few deep breaths and remind myself that only I can make it a great day. Great information and easy to implement tips! I’ve personally had success with brainstorming the pros/cons to come up with a solution and found my boss was impressed when I was prepared to suggest the best course of action while communicating the alternate solutions I considered prior to coming to my decision. It gives the impression you are well prepared and made a thoughtful and educated decision rather than coming to your boss asking “what should I do?” Great advice! Interested in the book and learning more! SO many reasons WHY we don’t go past the issue and on to resolution, but it’s true. In the past, I have failed to challenge myself to go further than my pain, so I ended up wallowing for a bit. It’s also unfortunate to work where it’s not safe to have those initial feelings, and the squelching of those feelings can lead to not even imagining a solution! Hopelessness breeds the lack of initiative to resolve an issue. 1. The obstacle for all three of these is ego. As hard as it is for leaders, we have to check our ego at the door. 2. I’ve used the three-alternatives approach to solving a problem. it works great, because it forces you to get creative instead of fixating on one solution and it gives other stakeholders the option to choose, which is easier than creating. 3. 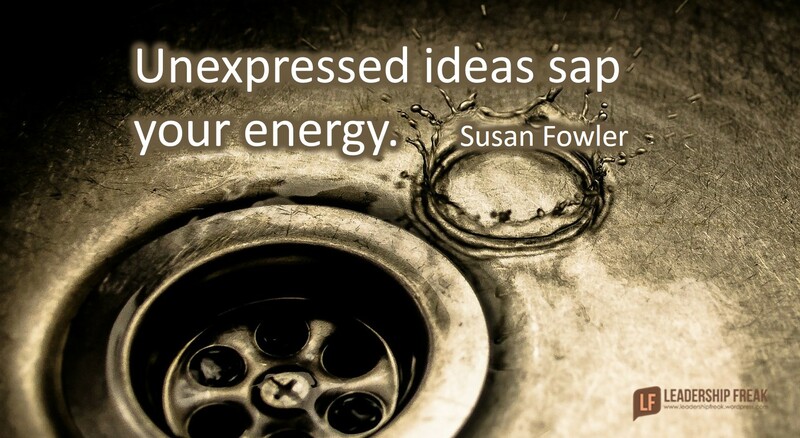 “Unexpressed ideas sap your energy” is spot-on. Obsessing over whether to share an idea or not can drain your reserves like nothing else. Great tips! Very interested in the book. Love the first tip! Can’t wait to read more! Thank you, I needed this message today. You get the behavior you reinforce. I have truly never thought of it this way and it is a great way to re-frame how we think about feedback. I’m going to ask for feedback today. “Being a proactive self leader early in your day measurably decreases your experience of stress and increases energy by the end of your day”….what a positive start to the day and if the outcome is less stress and more energy then it’s a win-win! I’m going to try these tips. Very interested to read the book. I am very interested in this book. I am a leader in the emergency services sector. I struggle with consistancy amoung my middle managers in providing leadership that others will follow. Helping supervisors understand it starts within ourselves will help a great deal. Great Post. Fantastic, really helpful. Thank you! What an awesome reminder! Leader sets the attitude and the altitude of the team, if you aren’t leading with energy then your team will not either. I like the idea of starting my day with voicing a concern or fear and then systematically working to find a solution. I can see how this will start my day off on the right foot, and create a mindset to continue the process. I like the idea of asking for feedback. I have also found that people sometimes want to give feedback, but feel like it is not their place to do so. By asking for feedback, it gives the other person permission to speak as well as preparing your emotions for the discussion. I appreciate the reminder of inviting feedback. As a leader, it becomes easy to push the need for meaningful feedback aside. If we do not model these three practices for positive energy and interaction, those who follow will likely not practice them either. Working in an environment where creating positive energy is a daily challenge, this is definitely a good word! Leadership start with ones self, and this is a great post to remind each of us of that important step in our roles as leaders. Very good quick tips about leadership and how we can be better leaders every day. This is a helpful post. There is no mission leadership or organizational leadership without self-leadership. Managing one’s internal world while proactively seeking feedback and then acting on what is heard is essential leadership effectiveness. The post suggests generating at least 3 ideas and then examining pros and cons. When I coach I find it is helpful to ask people to generate at least five possibilities. The first two or three come easily. It is often idea 5 or 6 that proves to be the most useful. Of course all the ideas still need to examined by the leader and then by others. Very interested in the book! I am the Director of Learning & Development and would like to consider this for an upcoming leadership round table. Thank you! Love the quote “unexpressed ideas sap your energy”. I am going to hang this on my bulletin board. Thinking of 3 ideas is awesome. Often, we jump into one solution without really putting thought into other options. It’s always good to slow down and think. Love the comments on Feedback. Both giving and receiving feedback can be intimidating for a leader and recipients. Building on relationships and finding ways to include feedback in “conversation” can be the bridge to foster less defensiveness and more receptivity. I always try to ask someone that I work with that day “what can I do to make this easier for you next time”? Feedback is essential to becoming a good leader. Growth doesn’t happen on its own – it is fostered by those around you and your only willingness to change and improve. Great post! Thank you. I have been sitting on a few ideas that I have thought would probably be ignored, becuase they address concerns that I believe are presently being ignored. I’m going to submit them now so I can keep moving forward and continue to be effective in growing and working to expand our organization. Loved Susan Fowler’s book why motivating people doean’t work and what does. Thank you so much. I have been sitting on a few ideas that I have thought would probably be ignored, becuase they address concerns that I believe are presently being ignored. I’m going to submit them now so I can keep moving forward and continue to be effective in growing and working to expand our organization. Loved Susan Fowler’s book why motivating people doean’t work and what does. We sometimes get hesitant to ask for feedback not knowing what the response will be but we can’t learn and get better without it. I also like this comment: People don’t resist feedback, they resist receiving feedback not requested. Makes you think about better ways to give feedback so that others aren’t as resistant. Wow, very need in a time when our company is experiencing growth and change. Gives me something to focus on as opposed to all the new executives walking in the door. Thanks!! Appreciate the insights! In my humble opinion,being a self-leader is also about having the discipline to be consistent with one’s values, behaviors and style. I would also add integrity and character that seeks to do what is “right” in any given situation, no matter what is on the line are other important tenets. This article meets me exactly at my point of need! I can honestly say that I have struggled(very recently) with unsolicited feedback. I do realize that feedback is valuable and the tips provided in this article helped shape my perspective. The steps to overcome are excellent. As a matter of fact, I just emailed my manager requesting feedback on a particular matter that I handled. I feel like I am on my way! I enjoy the combination of Win-Win and starting with the end in mind which is what we need if we want to grow and better be able to serve others in a leadership role. How to get ourselves and then others past the defensive and self protective stands that crop up so naturally. Requesting and modeling the need for feedback should be helpful. This is a great entry! it is so easy as a manager or supervisor to get bogged down and worried about helping your team to develop that you can easily forget to spend the needed time on your own development. This was a fantastic read and a great reminder to me the importance of personal development! Great tips. When the focus or direction of your organization shifts, do not indicate to your staff that the work you have previously supported wasn’t really what you wanted them to be doing. It’s disheartening and demotivating, and can sabotage future efforts in the new direction. Great read to start the day. Heading out now to get some feedback! Thank you for the perspective on the proactive approach when facing a problem! This is something I can easily implement that I feel will make a difference! Good message. I find that the more I trust the person giving the feedback the more inclined I am to receive and implement. I also approach those I trust before meetings or presentations and request feedback. I tell them what I feel “success” should be for the meeting or presentation so they know what my goal is. They can then formulate the feedback based on what it was I was trying to achieve. It is helpful for me. Great tips and information! I enjoyed reading all the other comments as well. It’s always comforting to know your not alone. The question I ask each day…..How do I want to show up? Fishing for a free book, let me add that we are LOOKING for some really solid hooks on the issues of selfless leadership and continuous continuous improvement to anchor the collaboration and alignment activities that we build into The Search for The Lost Dutchman’s Gold Ming team building game. Scott Knutson is finishing up a doctorate and his anchor points revolve around Servant Leadership. I simply do not like that term, although the behaviors it sets up as expectations are great. He is driving the design of a full-day team event tied to LDGM and to SL kinds of awareness-generation. CAN we really make leaders more aware of their support role in improving the lives and performance of other people? That is our driving force for this project. Some of these self-improvement self-awareness leadership development ideas are really solid ones. Feedback asked for is a sign of self leadership. Additionally if a leader and a subordinate have a good working relationship built on trust and respect, feedback works even when it’s not asked for. When feedback doesn’t work, is where a person receiving the feedback lacks respect for the person giving the feedback. Exemplary leaders build that trust and respect first and create a culture where it’s OK to challenge the norm without fear of reprisals. Reflecting at the end of day can also energize you for the next day. On my way home (I have a 40 minute commute) I think about how situations went, what could have gone better and what went well. This is great advice. Would love to learn more! With so many books and perspectives on leadership, leaders forget about their own example. Authentic leadership means the leader shows followers how it’s done. I would receive negative feedback only that was detrimental to be accepting it. Then I started receiving positive feedback first followed by how to improve my skills. This made it more inviting to me to accept everything that was told to me. I now will start with positive feedback and my people are more willing to receive and accept the ideas. I always ask a critical friend to “spy on me” during a meeting and provide feedback regarding tone, body language, etc. This way, it’s not the supervisor who is providing the feedback but a safe person who will be honest and has no personal agenda. Their feedback will be less threatening. This sounds like a great book, I am very interested in reading more about her leadership strategies. Great thoughts. I really appreciate the step to come with 3 different solutions and the reminder to seek out feedback. Always willing to learn more! Of course, proactively voicing one’s opinion is not always received in a positive manner, no matter how positively one presents their view. Would love to have a copy of this to use in my coaching with team members on self development. Great information !!!!!!!! I think that if you lead yourself well, you have accomplished an amazing conquest. Great concept and a positive thing to work on! This was well worth the read. Thank you! Leadership expert, Marshall Goldsmith, provides a great thought on the challenge of changing people’s perception of our leadership–“Because we don’t keep track of our repeat behavior, but others do, we don’t see the patterns that others see. These are the patterns that shape other’s perception of us–and yet we are largely oblivious to them! And once their perceptions are set, it is very difficult to change them. That’s because according the the theory of cognitive dissonance, people see what they expect to see, not what’s there.” Goldsmith goes on to say that it’s important to repeat the corrected behavior over a period of time and then ask for feedback on how we are doing. This assures others that you’re trying to make progress and allows them to realign the patterns that we are trying to model. Modeling a proactive approach- something g I strive for daily! Very interested in book. Just sent out a request before my next meeting for a colleague to give me feedback after the meeting. Great suggestion! I love feedback! Much like the post described, I love feedback… when I ask for it. Looking back, the times when I have not asked for feedback, but received it anyways are when I was most caught off guard. I assumed that what I made was perfect and did not need critique. Maybe I need to go into situations looking for more and wanting more feedback. Maybe this is something that can set me up for success. “Unexpressed ideas sap your energy” is such a true statement. It’s really toxic to your mental and even physical health when you try and keep quiet. I saw a video recently by Marcus Buckingham talking about how people do not like feedback…they want coaching and attention and that they only can take feedback through coaching…This gets complex and more and more is focused on what people want or do not want and how it has to be on their terms…As groups get larger, more diverse on every level, this is a BIG conversation…That includes that if feedback is requested how much of the motivation is validation and the only acceptable response…not to mention the Marshall Goldsmith nugget above…again…such a BIG conversation and a vital one to have…thanks for this opportunity. I could certainly use more positivity in my life. I hope to be one of your chosen few. What does the practice of self-leadership look like to you? For me it is about doing the small things daily so that they become more of who I am. Asking for feedback is something that I could do more often. When I have done it, I have found that it has opened the door to develop better working relationships. Self leadership, knowledge of self, of others and our impact on our environment is crucial if we are to change the world around us. Asking for feedback takes couage but is worth it when we are open to hearing what comes back. Thanks for this timely reminder. I’ve been inspired by the leadership in my company on what not to do. Increase energy and decrease stress by leading myself first. So true – it all begins at home! Love the nod to proactively seek feedback. Grateful for your post and your giveaway. It is always interesting to read. Definitely interested in the book would like to learn more!!! Proffer your best solution when articulating the problem. Love the three points in the article. I know I could use these in my “toolbox” of things that work. Susan, your insights into self-leadership seem well-founded, but there’s a real risk that readers who embrace self-leadership could do so in a self-centered or self-absorbed manner. Your phrase, “To effectively lead others, begin with your own self leadership skills,” implies that the ultimate goal of self-leadership is for a greater good beyond that of self. I suspect you might have been thinking that to effectively lead others, the servant leader must begin with his or her own self-leadership skills. Just yesterday I asked for feedback (prompted by your awesome posts of late) and I received positive feedback and educational feedback, which encourages me to proactively ask for feedback again. Enjoyed this post – agree that asking for feedback is always easier than the feedback that is ‘imposed’ 🙂 Thanks for opportunity to gain a copy of the book. The third item is pretty easy for most leaders, but tasks one and two take a level of humility that leaders must learn and hone. Very interested in this book. It sounds like it will help me in my restless pursuit of doing better for myself and my teams. Great article. I did this the other day with a peer. A spur of the moment request for feedback. And while it put him on the spot, it led to some great conversation that has helped me with specific areas I should keep working on. It also uncovered some unsaid thoughts he was having but hadn’t expressed outwardly. It gave me the opportunity to clarify and provide context. “Feedback requested is far more effective than feedback imposed” – One of my favorite leaders once approached me after hearing me give a presentation on continuous improvement and really caught me off guard when he asked me “are you open to some feedback?” This floored me as no one had ever asked me this before and I found it very empowering, even though I still cringed a bit as I was a bit fearful that it might not be positive (it was positive). There are days when I might not be in the right frame of mind to hear or be open to feedback so to have the power to say “Yes!” or “Not right now” was huge for me. Even if the feedback is positive it is still helpful for me to be in the moment, ready and open to what is being said and if it is an opportunity to improve or grow, it is doubly important for me to be open to the feedback. Since then I have also been more proactive in asking for feedback by scheduling brief meetings with my supervisor after a presentation or training session will the sole intent of getting her input and feedback on what worked and what didn’t work. I have found this lessens any resistance I might have had if she had just provided feedback without my asking for it and it ensures I am prepared to hear the good and any opportunities to improve. Thank you, Susan – great read! Love the simplicity of these ideas – easy to form the habit! #2 I can really relate with. I’ve noticed my stress go up when I hold onto ideas or comments overnight or dismiss my own ideas. Pick Me! Pick Me!! Please and thank you, with a smile. I took part in a webinar with you on Self Leadership today, Susan. I loved your ideas on how leadership in fact has very little to do with ‘positions’ and ‘titles’. If we can shift our perceptions to see ourselves as leaders of our own lives, it becomes more natural to take the view that we can and should ask for the kind of leadership we need. ‘Leading or managing up’ are key in how organisations and projects can become successful (let’s face it, many are staggering forward due to some long-dead momentum rather than any current vitality, and fear in turbulent times is making the situation worse). I’d love to have this new Blanchard book that you’ve been instrumental in producing if you’d like to give it to me – but I’ll let you into my secret now. I’m in the UK, not in the continental USA. So I’m not eligible! Boo! The daily habit of leading ourselves is critical in personal growth, developing as a leader, and staying on task with what is critical in our lives and business…setting the tone for all those around us in society. Leading by example starts from within! Feedback often feels like criticism unless we as leaders make the work environment a safe place to take risk and fail. As leaders we must willingly step out, take risk, fail, and be willing to accept feedback on the road to continuous improvement. I am a big fan of “feedback” and constantly seek it. I really like “Feedback requested is far more effective than feedback imposed.” Good post, Dan. Thanks! I’m interested in reading further. I’m a big proponent for owning your own career and being an active leader (and participant) in your development. The advice to think of alternatives to your idea and the pros and cons of each is a great lesson. Too often, we focus on just our idea and “winning” (i.e. implementing it). Having the discipline to think through alternatives can help develop a broader range of ideas and help all move forward. Found many parts of the One Minute Manager to be so effective so I think I would really enjoy this book! “Feedback requested is far more effective than feedback imposed.” LOVE this quote! This is great stuff. I want to model this for my team! Good ideas on how to be more proactive! It is a more positive way of starting your day! I would love to read this book! Need all the help I can get. Unsolicited advice is always viewed as criticism. Others generally do the things I model. If I want to give feedback I must be willing to receive feedback. When posing a solution, always start with why. This includes “Generat(ing) at least three alternatives with pros and cons for each, then choose one to recommend as a path forward.” Before posing solutions, describe why the problem exists in the first place. This definitely sounds like a great resource book, I am looking forward to reading it. The problem with most of these is that too many people focus on the negative. Negative feedback, negativity about problems and negatively reacting when people offer solutions. I have actually been criticized for being positive because everybody wants to be negative. Very sad, because negativity does not lead to creativity. Look forward to reading the book. Unexpressed ideas sap your energy. That is 101% true. In my case, if I don’t express my query, it silences me for the rest of the discussion. I feel disconnected which leads to lowest level of confidence and a heavy burden on mind. I would love to read this book! I can’t stress enough how the key to success always starts with recognition of one’s own energy state and utilizing methods that work for each individual (which may vary) to get into a high energy state!! Best ideas come from being in a high energy state.